Was testing my Jumpconda on neutron highways, for some unknow reason after jumping about 2700ly, i ended 560ly from Gnosis so i visited it (and left something there to know where it is). On my way back tho, i used the highway again on other direction just to find many lazy CMDRs names, they just scan the main star and move on and left many planets and moons undiscovered, so i just fixed some of those. Loitering in Orrere, was at wreck site getting mats. Noticed Orrere is run by The Code. Yuk. Considering whether to start playing bgs game there to annoy them. Hello again, after a lengthy hiatus caused by my disillusionment with the core game (I still don't have Horizons), I'm back at hauling people to LTT9360. Special thanks to FDev for making it even harder now, with removal of board hopping, you guys will always have a special place in my heart. I'm sitting in my AspX, within Jameson Memorial, and looking at the pathway I've just plotted. 885 jumps, 19,998 light years, to a small speck called Prungeau II-R D5-4, on the far right of the Bubble. Idea is to get as far away from everything as possible in an un-engineered AspX, while scanning for terraform candidates and Earth-like worlds along the way. If humanity is to survive not only alien invasion(s), but also themselves, it needs to scatter all along the galaxy. Currently bunkered in Adenate waiting to finish up my first CG participation. 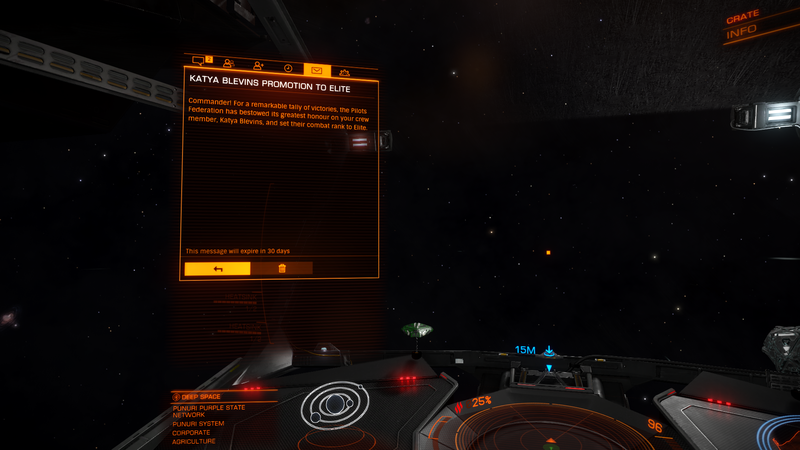 On dropping into the Haz Rez on Adenate 8 and seeing a midnight black be-spiked cutter prowling the ring I nearly turned tail, but on receipt of a O7 and a wing invite we instead tore up those pirate scum, earning enough to get me into the top 10% bracket. Third time I’ve winged up, it feels like a different game, thanks to the CMDRS I’ve run into so far. I've been moving every week and shooting at Thargoid Scouts in my limited playtime. I'm up to Deadly +49% toward Elite. I think I've gained about 30% or so in the past couple of months. I recently bought a Krait Mk II and imaginatively named it "Crate". I've been enjoying it so far, even though it is (mostly) un-engineering. It's quite a change-of-pace from my Corvette. Somehow, the SLF pilot that I hired shortly after reaching Deadly has already made it to Elite. I'm happy for her, but somehow it just doesn't seem right. Think of of it like grading on a curve. Your an all star, on a champions league curve. The hired hand is in the proverbial, parking lot behind the employment center, basketball pickup game. Got my new Mamba and going to engineer the hell out of it. New goals for the new year. Off into the black in my shiny new 63ly Phantom, intention is to stay out for a few months. Already found some "things"